Have you ever wondered what Sue, the Field Museum’s T. rex, would look like with some meat on her bones? Now you can find out just steps outside the museum’s doors in the new “Jurassic World” exhibition. 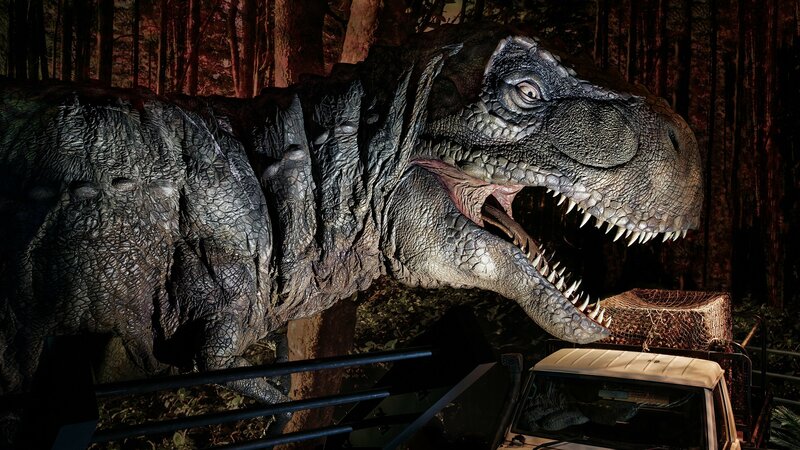 Presented in partnership with the Field Museum, the “Jurassic World” exhibit aims to be an immersive experience that brings the 2015 movie and its gigantic reptilian stars to life. Visitors explore Isla Nublar, the island that is the site of the fictional dinosaur park “Jurassic World,” through a series of jungle environments featuring lifelike animatronic dinos from the placid to the petrifying. Also on the tour: a training paddock similar to the one in the movie where actor Chris Pratt’s character famously soothes snarling raptors. “Jurassic World: The Exhibition” is on view at the Field Museum through Jan. 7, 2018. Add-on tickets to a Field Museum visit are $15 for adults and $10 for children during regular museum hours. The exhibit will also be open for evening visits from 5-9 p.m.; stand-alone tickets are $25 for adults, $20 for children. May 15: They can play blackjack, dance and climb walls. The Museum of Science and Industry brings back its interactive exhibition – with a few new additions. April 13: A Field Museum researcher is among a global group of scientists who have discovered an early dinosaur that reshapes our understanding of dinosaurs’ evolution.